Two die in underground tank at Lagos filling station - BlogIT with OLIVIA!!! Two men suffocated while cleaning the inside of an underground petrol tank at Fatgbems Filling Station around the Berger Bus Stop, Lagos on Friday. The victims, Adekunle Ipaye and a young man identified simply as United, were reportedly contracted to remove fuel sediments in the tank early in the morning to avoid the heat that makes such task difficult in the afternoon. Saturday PUNCH learnt that there was panic in the station around 6am when United, who initially went into the tank suffocated. Ipaye had apparently gone in to help him when he suffocated too. Lagos state emergency officials were later called in to the scene. They went into the tank shortly after the men became unresponsive and found them dead. None of the victims used any form of safety kit. 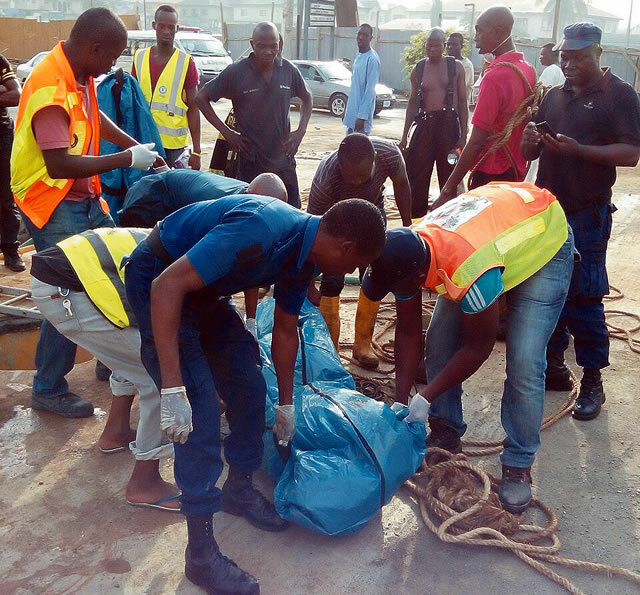 Spokesperson for the Lagos State Emergency Management Agency, Mr. Kehinde Adebayo, said the bodies of the victims were removed and deposited at the Lagos Mainland Hospital Mortuary. It was learnt that other contractors at the station were arrested by the police from the Ojodu Police division. The LASEMA General Manager, Mr. Michael Akindele, said the bodies were evacuated by the State Environmental Health Monitoring Unit. Akindele said proper investigation would be conducted to ascertain what led to the incident and warned artisans to adhere to safety precautions while carrying out underground cleaning and other duties. The Director of the Lagos State Fire Service, Mr. RasaqFadipe, also urged the public to seek the agency’s technical support in carrying out maintenance and construction work. However, a statement by the company’s Corporate Planning Manager, Adeyinka Adeyemo, explained that the company is cooperating with the police and all other agencies on the case.